One of the ways I come out of my postpartum fog is by getting out of the house and traveling. After having my second child and two weeks later an appendectomy I had cabin fever BAD as did the rest of my family. One particular weekend in January it was oddly warm and we decided to go camping at the beach (we live in the Florida Panhandle). It seemed a little bit nutty at the time, but once we got out there we were able to connect as a family and take a breath of fresh air. It was healing… and exhausting. Don’t get me wrong, it wasn’t blissfully easy to travel and CAMP with a baby, but for my family it was totally worth it. Since then we have traveled to Jacksonville, Central Florida and I just got back from our longest excursion which was to Charlotte, North Carolina for a girls weekend. Everybody keeps telling me I am nuts, but honestly I have enjoyed traveling and it has been good for my mental health. I have learned a few things about traveling with a baby in the car, and I thought I’d share my secrets with you. *I do not promise a lack of crying, but hopefully you will have less of it and therefore a more enjoyable trip. 2. It’s about the journey, not the destination. Seriously, this is where a lot of parents get hung up. Life does not begin when you finally reach the place you’re traveling to, life is in the car with your children. Laugh at how ridiculous the trip is, eat fun foods, play with your children at rest stops, and just enjoy it. Remember how fun road trips were when you were a little child (or were they?)? Start a habit of living in the moment and not getting hung up on the fact that it’s taking awhile to reach your destination. 4. Be flexible. 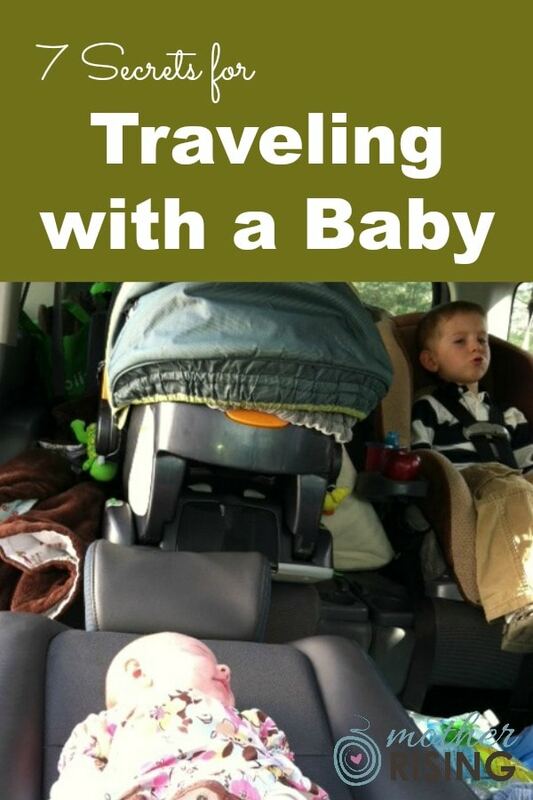 Flexibility is a must when traveling with a baby. I recommend trying not to make firm travel plans. If your GPS is telling you that your ETA is 5 pm, tell the people you are going to see you’ll be there between 6 and 7 pm. If your agenda is jam packed all throughout the day, remove some stuff to give yourself a buffer and some time to rest and decompress. You and your baby will be happier if you are not tied down to a particular agenda ALL day. 5. If the journey is long, consider staying at your destination for more than a few days. It can be really overwhelming to travel with a baby so I suggest breaking it up and staying longer at your destination. 3-4 days will be much easier to deal with than a shorter stay of 1-2 days. 7. Buy and use the Happiest Baby on the Block CD or MP3. Especially if your baby is three months or younger, this will be so helpful. These tracks contain sounds that can calm the most upset of babies. When my baby started crying and I knew she was fed, dry and just tired I turned this on via my iPhone and she was lulled to sleep. My three year old thought it was a bit ridiculous and “too loud” but IT WORKS. I typically saved this as a last resort (because I forgot about it) and I was so glad I had it. For the times when you can’t be constantly holding, nursing and comforting your baby this was a life saver. PS – If you’re looking for other must haves when traveling, check out my natural baby registry. There’s some REALLY good stuff on there! What are your best travel with baby tips and tricks? Leave a comment and let us know. We’d love to hear from you!